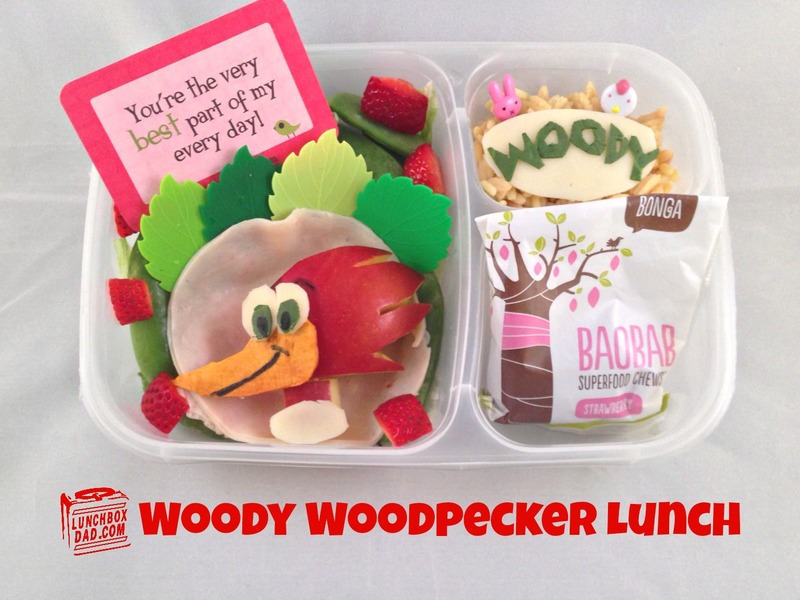 Year 2: Week 33: Woody Woodpecker Lunch. 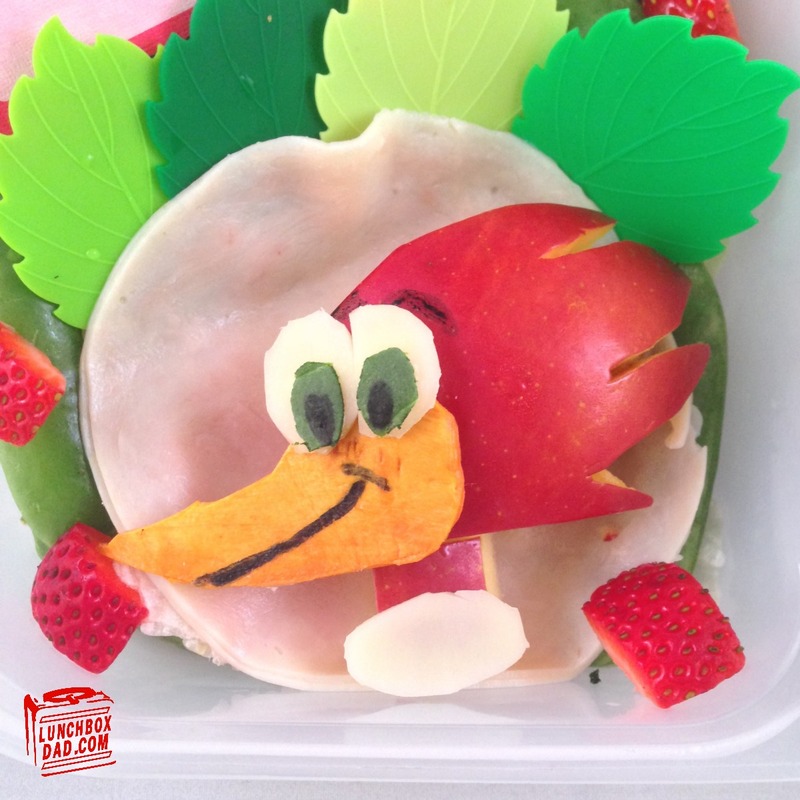 My kids have loved watching Woody Woodpecker on Hulu lately. Don't ask me how they got started on it, I have no idea but when they get to watch TV this is all they ask for right now. My daughter couldn't believe that I actually watched it when I was a kid. I couldn't remember much from the cartoon so I had to look it up. I included some food picks for a couple of Woody's friends. There is Oswald Rabbit and Homer Pigeon. 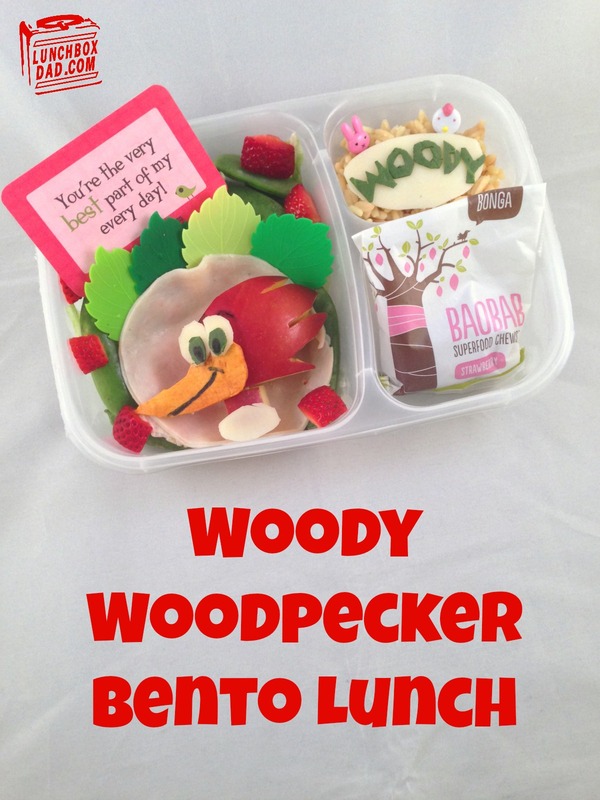 I made the lunch in an Easy Lunch Boxes container and included a Lunchbox Love note. The plastic leaves in the lunch are called baran. I also included Baobab "Superfood Chews" from Bonga. They are like fruit snacks and are pretty healthy. Plus, they have a tree on the package which goes well with the woodpecker theme. I will tell you all about them in a review post soon. Have a great week and remember to follow me on my social media channels for so much more fun and ideas! 1. Slice a red apple in the shape of Woody's head and hair. It is easier than it looks. Also cut out a rectangle for his neck. Cut his beak out of dried mango. You can attach the beak and neck using a toothpick. 2. Cut cheese circles out for the eyes and neck piece. Also cut circles out of fresh spinach for the eyes. I glued all pieces of the eyes on using a dab of cream cheese. Draw facial features using black food coloring. 3. I used snap peas, turkey, and strawberries for the background because its what I had in my refrigerator. You can use whatever you would like. 4. 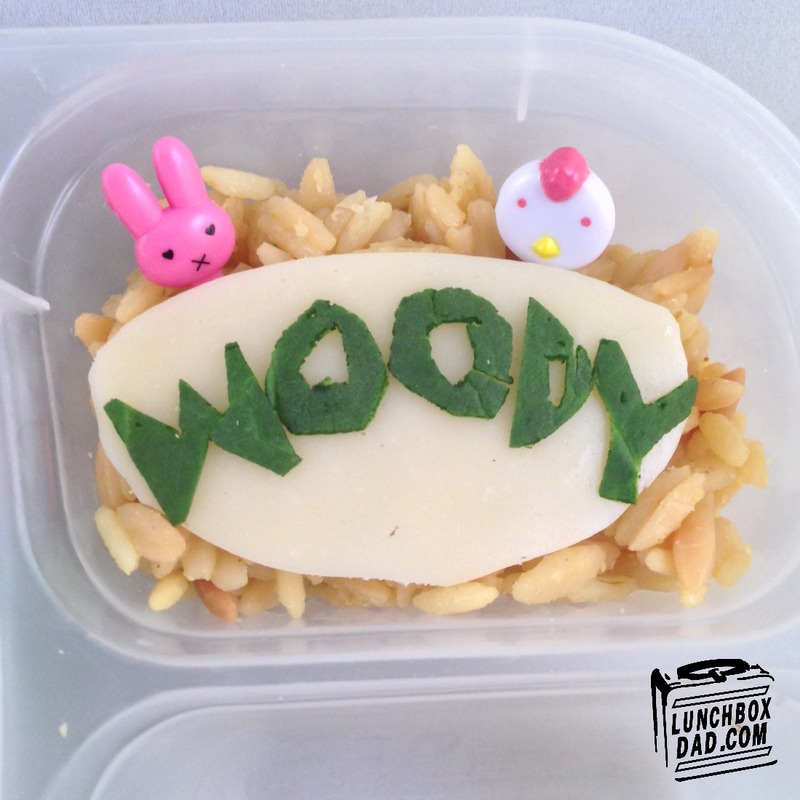 In one side dish I had rice leftovers so used that with another circle of white cheese on top with "Woody" spelled out in spinach. The other side dish had the Baobab Super Food chews in it. You can finish it off with a Lunchbox Love note as I have. This is so freakin' cool.